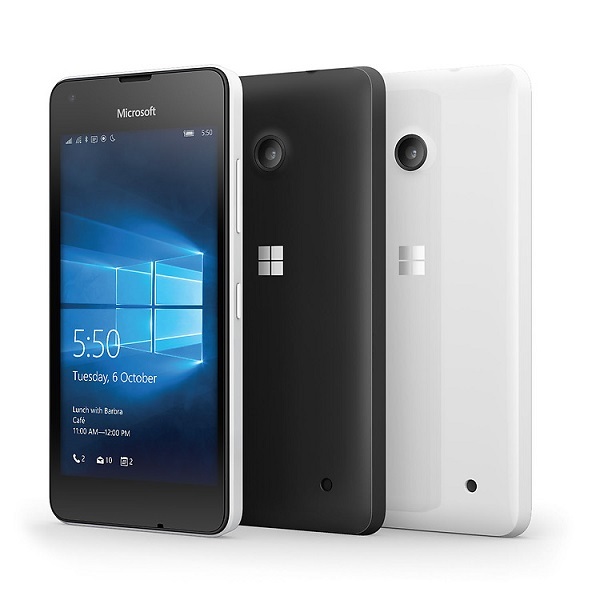 Microsoft announces Lumia 550, Lumia 950 and Lumia 950 XL smartphones. Microsoft on Tuesday unveiled new Lumia 550, Lumia 950 and Lumia 950 XL smartphones, the first Windows 10 Lumia phones and newest premium phones from Microsoft, at Windows 10 Devices event held in New York. Microsoft's new devices comes with Continuum for phones, which enables the new Lumia 950 and 950 XL phones to work like PCs. Microsoft also announced the Lumia 550, its most affordable 4G LTE smartphone running Windows 10. 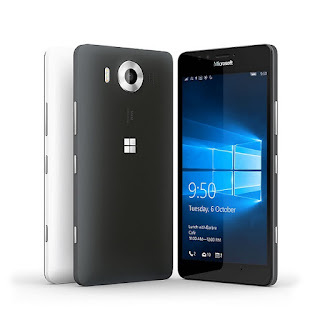 Lumia 550, Microsoft's most affordable 4G LTE smartphone running Windows 10, also joins the Lumia family. Lumia 550 takes the affordable Lumia to the next level with a 4.7-inch HD display, Qualcomm Snapdragon Quad-Core processor, 5MP rear-facing camera with LED flash, and 2MP front camera for quality Skype calls - all for just $139. Lumia 550 priced at $139 ERP and will begin rolling out in select European markets in December, with additional markets to follow. The Lumia 950 sports a 5.2-inch AMOLED Glance screen with crisp WQHD (2560 x 1440 pixel) display resolution with 564 ppi. Made from Corning Gorilla Glass 3 it comes with super-sensitive touch, as well as orientation sensor and sunlight readability enhancements. It comes in a choice of White or Black colors and measures 145 x 73.2 x 8.2mm and weighs 150g. 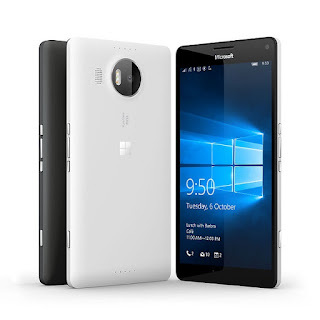 The Lumia 950 powered by the 1.8GHz Hexa-Core Qualcomm Snapdragon 808 processor and backed by 3GB of RAM. There is 32GB internal memory and up to 256GB of additional storage using the microSD. The 3000 mAh battery offers up to 12 days of standby, or up to 18 hours of talk-time in standard 3G mode. On the back of the Microsoft Lumia 950 you'll find the 20-Megapixel camera with six-lens ZEISS optics and triple LED natural flash, which adapts to any scene. Rich Capture automatically chooses the best camera mode, allowing you to take crisp images even in challenging conditions. 4K video capture helps ensure you never miss a detail. You'll find the fifth generation Optical Image Stabilization (OIS) is also present for amazing image control. On the front is a 5-Megapixel front-facing camera with 1080p video recording, making it ideal for use with the integrated Skype app. You can use your Lumia 950 like a PC by connecting it to a bigger screen, keyboard and mouse with Microsoft Display Dock, an optional accessory that enhances the new Windows 10 Continuum experience for phones - and simultaneously charges your device. Scale and display Windows apps beautifully on the bigger screen when connected, or work on a Microsoft Office document, browse the Internet and stream movies for your kids. Plus, you’ll be able to use your phone independently to take a call or send a text message while you continue to enjoy apps on the bigger screen. The Microsoft Lumia 950 will begin rolling out in November in select markets with a price of $549 ERP before taxes and subsidies. The Microsoft Lumia 950 XL runs Windows 10 Mobile and puts the power of a PC in your pocket. Offering stunning dual-antenna technology, Hexacore processing and liquid cooling technology first seen in Surface tablets, this is the Windows 10 Mobile smartphone to lead them all. The Lumia 950 XL sports a 5.7-inch AMOLED Glance screen with sharp WQHD (2560 x 1440 pixel) display and 518 PPI for amazing color reproduction. Made from Corning Gorilla Glass 4 with automatic brightness control, you'll find it also packs in super sensitive touch. It comes in a choice of Black or White and measures 151.9 x 78.4 x 81.4mm and weighs 165g. The Lumia 950 XL powered by the 2GHz Octa-Core Qualcomm Snapdragon 810 processor and backed by 3GB of RAM. There is 32GB internal memory and up to 256GB of additional storage using the microSD. The 3340 mAh battery offers up to 12 days of standby, or up to 19 hours of talk-time in standard 3G mode. The phone comes with Qi wireless charging built in as standard that allows for fast charging. On the bottom of the phone you'll find a USB-C connector, which allows you to hook up to your laptop or the new Microsoft Display Dock. It can also be used for charging your phone, which comes complete with fast-charging, so you can go from zero to 50 per cent charge in just 30 minutes. It also supports up to 5 Gbps in terms of data transfer rate. On the back of the Microsoft Lumia 950 XL you'll find the 20-Megapixel camera with ZEISS optics and Triple LED RGB Natural Flash that comes with the fifth generation Optical Image Stabilization (OIS) for the best image quality yet. You'll also find it comes with a dedicated camera button that offers one-click 4K video and continuous autofocus when recording. This is rounded out on the front of the device with a 5-Megapixel front-facing camera with Full HD 1080p video recording. You can use your Lumia 950 XL like a PC by connecting it to a bigger screen, keyboard and mouse with Microsoft Display Dock, an optional accessory that enhances the new Windows 10 Continuum experience - and concurrently charges your device. When you're connected, Windows apps can scale smoothly and display beautifully on the bigger screen, helping you to get things done. Work on a Microsoft Office document, browse the Internet or stream movies for your kids. Plus, you can use your phone independently to take a call or send a text message while you continue to work on the bigger screen. Get the Microsoft Office and Outlook experiences on your mobile device, or use Office 365 with Microsoft Display Dock to unleash the power of editing features on a bigger screen for a PC-like experience. The Lumia 950 XL will go on sale in select markets in November with a price of $649 ERP.